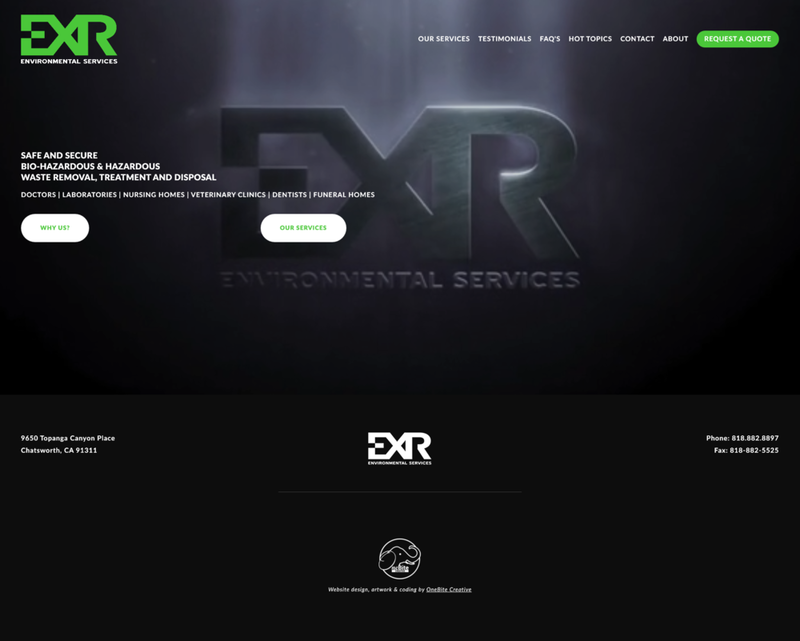 Tim came to us needing to do a complete Website Redesign for his company "EXR Environmental Services". The old website they had was too busy - starting right away with the homepage. This is a common problem we see with websites - we call it the “homepage heap” where they have so much seemingly important content to share (i.e. - sales pitch, testimonials, contact form, news, etc.) that the site visitor feels overwhelmed right from the get go. It’s too much… like trying to take a drink from a firehose. Also, another other issue Tim had was with their logo; a red biohazard symbol along with the company name. As a medical waste company they indeed deal with biohazardous materials… but using the actual biohazard symbol as the company logo seemed a bit “scary” and not welcoming. A change was needed! Take a look a the home page difference below. Notice how the homepage of the old website was full of content trying to cram lots of information. Needless to say, it was way too much content and was not friendly to the new, prospective clients (which are VERY important to a company’s continual growth). Now, look at the homepage for the new website - the visitor is met with full screen video which includes an impressive 3D animated rendering of their new logo, as if to say “You’ve arrived”. The homepage is simplified to cater to the prospective clients that come to their website. Two buttons for “Why Us?” and “Our Services” help to steer the visitor to where EXR wants them to go. The EXR logo was in need of an update as they were slightly changing the full name of the company. The biohazard symbol in red was a bit scary as a company logo. Since this is an actual symbol and not really a logo mark it was not good to continue using. Since “environmental” is used in the company name we changed company colors to green and blue (both friendly - ‘nature colors’ - think plants, water and sky.) The letters “EXR” are really the brand identity we wanted and to make EXR the focal point of the logo mark itself. So, after a few iterations the client was thrilled with the new version below. It is bold, easily legible and memorable. We here at OneBite Creative love the power of video and the movement it lends to a homepage. Below is the video that autoplays in the background (with no audio) on the new EXR homepage. Hmmmm… so you’re curious who made this amazing website? Talk about “the elephant in the room”!